What are the benefits of the best pet heating pads you can get? Well, to start with, additional heat applied doesn’t just keep your pet warm. It also has a therapeutic effect because heat improves the circulation in the area where your pet might have aches and it also helps to reduce the pain from muscle soreness. The best pet heating pads come in various designs and colors. Most are really affordable and all are a must have for a caring pet owner. When the cold weather is approaching, you should invest in the best pet heating pad. Even if your pet is perfectly healthy, a heating pad will provide a warm place to rest in the cold weather. As for older pets, the pad will ease the pain of a cat or a dog who suffers from bouts of arthritis or have hip and joint issues as soon as the temperature drops. In addition, apart from being beneficial for your pet’s sore muscles, the heat provided by the heating pad is a simple but effective remedy for pets with arthritis and joint problems. Since cold environment usually aggravates these conditions, a pet heating pad is an affordable solution to improve your pet’s health without expensive visits to a vet. It’s also the first line of defense against over the counter drugs which are often bought without consultation and which cause as much harm as good, and sometimes even more so. Treating arthritis as well as joint and muscle problems in pets using a heated dog pad has been proven to be an effective and cheap method. Serious studies have confirmed the effectiveness of heating pads as therapeutic relief and healing method which actually works. We’re going to cover the most important features of a good-quality pet heating pads and go over the advantages and disadvantages of different models. Hopefully, we’ll help you narrow down the choice and finally pick the pad which will meet your pet’s needs and fit the budget without breaking the bank. Do I need a heating pad for my pet? Absolutely yes! You’ll be able to alleviate arthritic and joint pains in your pet. What’s more, this isn’t the only reason for using heating pads for your beloved pet. A good-quality heating pet pad will also benefit smaller animals as well as dogs and cats that get a cold easily. For example, dogs with thin coats can catch a cold much more quickly than the thick-coated breeds, especially in autumn, winter and early spring. There are a few underlying health conditions which can cause your pet to feel chilly, even when it’s warm outside. The most frequent ones are heart conditions, hypothalamic disease, thyroid disease and certain types of cancers. The pad of your choice needs to be safe and comfortable for your pet and provide the much-needed extra comforting heat. If you are on a tight budget and trying to save some money by keeping the heating in the home low when you need to, you may put on a few extra layers of clothes, but your pet will indeed need a little extra heat which the pads provide. Fortunately, there are a lot of electric pet heating pads on the market. They are designed specifically for your cat or dog. Often unbelievably inexpensive, pet heating pads work really well and will keep your pets warm and healthy. When using any kind of electric heating pet pads, it is very important that you read all of the safety instructions and only use the pads as intended. Electric pads can become a safety hazard, so you need to pay close attention to your pet’s heating pad regularly to avoid any injury to your pet or damage to your home. You should check the pad for any sign of damages, punctures and you mustn’t fold the pad. For corded pads, you need to make sure the cord doesn't get entangled with the pet. Do not use any metal objects such as safety pins to fasten the pad into a certain position and always unplug the pad when you’re not using it. Avoid covering the heating pads with anything other than what’s recommended by the manufacturer. This will prevent overheating and potential fire hazards will be reduced. Also, don’t forget to consult your veterinarian before using all types of heating pads with puppies, kittens, ill pets, or pets who are in recovery from surgery. The heating pad should be waterproof especially if the pads are electric. Electricity and water are a hazardous combination. Go for a chew-proof pad. If your pet chews excessively, again for safety reasons, you should get a non-electric heating pad. The best pet heating pads have an internal thermostat to regulate its temperature, keeping it around 102 degrees F.
As for the wattage, it will vary with different sizes of the pad because the larger the pad, the more wattage is needed to keep it warm. The higher wattage of the pad doesn’t mean that the temperature of the pad will get higher. Most pads are kept to 102 degrees F as recommended by vets. You obviously don't want the pad to become a cozy home for fleas, so if you have a pup we recommend getting the best flea shampoo for dogs. Most pads that are made today are very energy efficient, and some cost less than an average night light to run. The mats with lower wattage will cost less to run and vice versa. For practical reasons, this pet heating pad doesn't hava e fluffy layer like heating pads for people because the tissue would quickly wear out as cats wiggle and stretch their legs while getting comfy on this cozy pad. Instead, the surface is made of rugged ABS plastic and a free fleece cover is included. The plastic is durable and easy to clean. If you notice that your pet would indeed prefer a softer surface, you can lay a soft cloth on top of the pad to make it even more comfortable. For the reasons of hygiene, do wash the soft cloth regularly. Your pets will be absolutely safe because there is a special steel cover which won't allow your pet to chew on the wire. The internal thermostat keeps the surface nice and warm even in the coldest weather so you can put the pad on your porch, in your shed, garage, barn, or anywhere your outdoor pets like to relax. K&H Pet Products opted for a dual thermostat. This means that there are two internal thermostats tol keep the surface of the bed at 10-15° F above ambient air temperature when your pet is not on the bed. 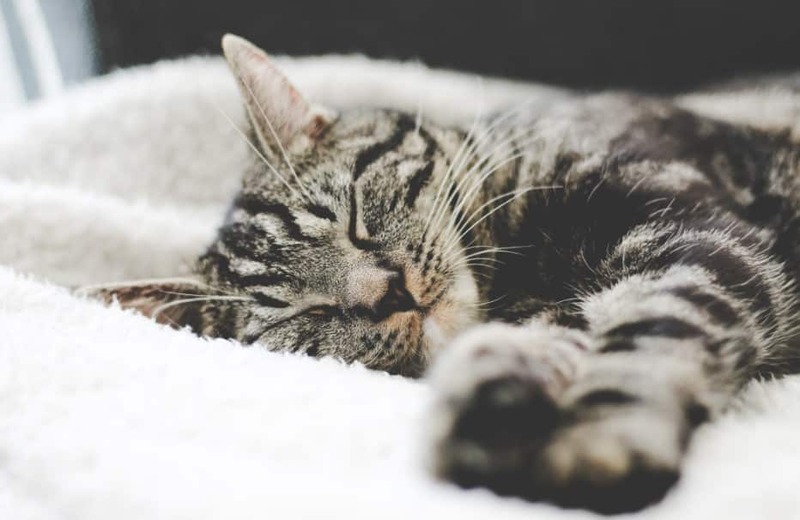 When your pet lies on the bed, the pad will warm to about 102° F.
The Extreme Weather Kitty Pad is really a great solution to provide additional warmth for any pets that spend their time outdoor. It is suitable for both indoor and outdoor use. You can also put it in your vat’s or puppy’s house to provide them with thermostatically controlled heat to keep your pet's normal body temperature during cold weather. You will need a power outlet close by or you can use an extension cord. The pad comes with its own 5.5-foot steel-wrapped cord. You should consult your veterinarian before use with young puppies and kittens as well as with pets which are recovering from a surgery or an illness and cannot get on and off the pad on their own. In general, it’s recommended that you leave enough free space for your pet to choose how long they want to rest on the pad. Overall, this is one of our best selling outdoor heated pet pads and for a good reason: the K&H Extreme Weather Kitty Pad keeps outdoor or feral cats cozy and warm, helps with aches and pain relief and keeps your pets healthy and happy. K&H Pet Products Lectro-Soft Outdoor Heated Bed Can be used outdoors or indoors, and on any flat and stable surface to keep your pet warm. The inner orthopedic foam is wrapped in water-resistant PVC which can stand up to the weather and dries quickly. This pet heating pad is soft but also made to be tough and durable. It’s ideal for dog and cat houses, porches, garage floors, barns, or basements but you can also keep it in the home. This pad is very energy-efficient, regardless the size you choose. This is partly achieved by the quality orthopedic foam inside the bed helps retain heat to keep pets warm and reduce energy consumption. The pre-set internal thermostats automatically monitor the surface temperature to keep your pet warm and comfortable. K&H outdoor pads are designed to warm to your pet's normal body temperature of 102°F when the pet lies on the pad. When your pet is not on the pad, the heat will dissipate into the air and the surface temperature will vary depending on the ambient air temperature. Once you plug in the Lectro-Soft, it will automatically warm on its own. There is no on/off switch to worry about and the pad will never exceed the natural body temperature of your dog or cat. You can use the Lectro-Soft with or without the included fleece cover. The washable, soft weave allows the pad's warmth to radiate through to your pet. This is a much better solution than a blanket or any other cover which would trap the heat inside the pad, possibly causing a malfunction. The K&H Lectro-Soft has been rigorously tested and certified by MET Labs. Their certification means that this pad adheres to strict electrical safety standards. You’ll have a peace of mind knowing that your pet is not just cozy and warm but also perfectly safe in its bed, as long as your dog is not a chewer. If he is, go for more rugged ABS models. To sum up, this soft, orthopedic heated pet bed will provide your dogs and cats with warmth and comfort, even in sub-zero weather. When in use, the internal thermostat is set to maintain a surface temperature which is ideal for your pet and you get a MEB Labs tested pad for your piece of mind. Snuggle Safe Pet Bed is a microwavable heating pad which provides up to 10 hours of safe and soothing warmth for your pets. This plate-sized pad fits under your pet’s bed and provides enough heat for any sized pet except for very large dogs. The Snuggle Safe Pet Bed is perfect for overnight warmth as well as keeping your pet warm for quite a long drive. All smaller pets can snuggle up to this cozy pet warming pad as it is. Alternatively, you can easily fit the warmed pad underneath a larger bed to keep pets’ beds warm during cold nights where they already like to sleep! This pad comes with detailed instructions on how long you should keep the pad in the microwave, based on your microwave’s wattage and power level. The Thermapol compound found inside the pad is completely non-toxic, making this a very safe choice for your cat. It’s a non-electrical pad which means no wires to get tangled or chewed on. As for the timing, after about 3 hours, the heating pad’s temperature stabilizes at 102° F and remains at this level for 5 more hours and then slowly cools down. It’s Ideal for newborns, convalescents, the elderly pets or any pet in a cold environment. This heating pad can provide warmth and comfort for about 10 hours day or night. It’s made by a reputable UK company and has been on the US market for 16 years now. Highly recommended by veterinarians, the Snuggle Safe Heat Pad is used by pet owners as well as breeders, rescue centers and kennels around the world. Meow Town Thermal Cat Mat is thermal cat bed with a very lightweight core that reflects the animal's own body heat back to them. So, you aren’t using any electricity but simply provide your pet with extra warmth naturally and safely. How does this mat work? Well, the thermal interior layer uses your pet’s body temperature to maintain a consistent level of warmth by returning the warmth back to the pet and not dissipating it down onto the floor, bed or car seat. This 22"L X 18½"W mat is an excellent option to warm up your pet when there’s no electricity around such as in a car or a bus as well as on outings. It’s also the mat to go for if you don’t want to worry about possible problems with wires or overheating. The pad is machine washable for your convenience; it dries quickly and can be used for a variety of small pets in different environments. You can use this cozy, warm cat bed in your home, as well as for travel. You can place it on the bottom of your pet's bed or cage or a traveling crate when you’re on the go. It’s really convenient during winter months and when you’re away from home: you can easily take it with you and keep your pet warm in your car or a hotel room. It’s big enough for any cat and other smaller fury pets. K&H Pet Products Crate Pad for Pets is available in six sizes and seven styles for you to choose from. It’s another naturally-warming pad for a variety of pets and crates. This flat pad from K&H Pet Products is a great solution for dogs that sleep in their crates. The pad radiates back the warmth of your pet back so your dog or a cat can feel warm and cozy without the use of electricity. The variety of colors available makes these heating crate pads fit most crates as well as room décor. The corner slits ensure that the pads fit even in crates which would otherwise be too small for the pad. In addition, the non-slip bottom will keep the bed in place for even the most active dogs or the bumpiest of car rides. These comfy pads from K&H Pet products are also machine-washable for even more convenience and better hygiene. You will love this pad because it maintains a good temperature which comforts but doesn't overheat your pet. The dog owners will appreciate the fact that the pads fit most crate sizes for a wide range of dog breeds. The charcoal-infused material and breathable mesh will help eliminate the pesky smells, and you'll love the chance to spoil your dog while keeping your home fresh and odorless. It’s also super-convenient when you're on the move and you’ll never worry about your pet being uncomfortable or feeling cold. 7 Best Cat Carrier Reviews 2019 | For your Cuddly Cat!